Over the past two years, CPD has highlighted inequity in the funding of Australia’s schools and a growing concentration of disadvantaged students in poorer schools. Uneven Playing Field (2016) and Losing the Game (2017) used My School data to reveal how our shared schooling experience in Australia was slipping away. In a Class of Their Own is a new series that extends this analysis, firstly in relation to Indigenous students. It does so a week after we observed the 10th Anniversary of the Apology to Australia’s Indigenous Peoples and consider how well our country is closing the gap of Indigenous disadvantage. Some inroads have been made in recent years in achieving better educational outcomes for Indigenous students. This paper does not devalue these achievements or the political and policy vision that underpins them. Notwithstanding, My School and other data point to gradual but significant trends that will shape the education of Indigenous students over the long term. While most schools have increased their enrolment of Indigenous students in both absolute and percentage terms, the proportion of Indigenous students is far greater in disadvantaged (lower Socio-educational Advantage – SEA) schools. These trends are magnified in regional areas where the majority of Indigenous students attend school. 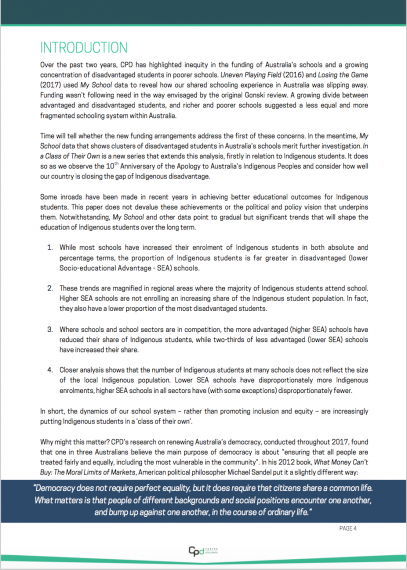 Higher SEA schools are not enrolling an increasing share of the Indigenous student population. In fact, they also have a lower proportion of the most disadvantaged students. Where schools and school sectors are in competition, the more advantaged (higher SEA) schools have reduced their share of Indigenous students, while two-thirds of less advantaged (lower SEA) schools have increased their share. Closer analysis shows that the number of Indigenous students at many schools does not reflect the size of the local Indigenous population. Lower SEA schools have disproportionately more Indigenous enrolments, higher SEA schools in all sectors have (with some exceptions) disproportionately fewer. In short, the dynamics of our school system – rather than promoting inclusion and equity – are increasingly putting Indigenous students in a ‘class of their own’. Why might this matter? 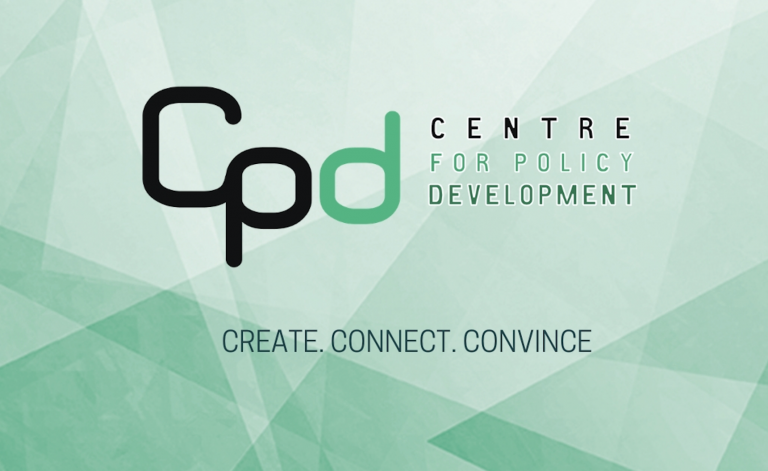 CPD’s research on renewing Australia’s democracy, conducted throughout 2017, found that one in three Australians believe the main purpose of democracy is about “ensuring that all people are treated fairly and equally, including the most vulnerable in the community”. Schools are critical to this and play a pivotal role in fostering a more equal and inclusive society. 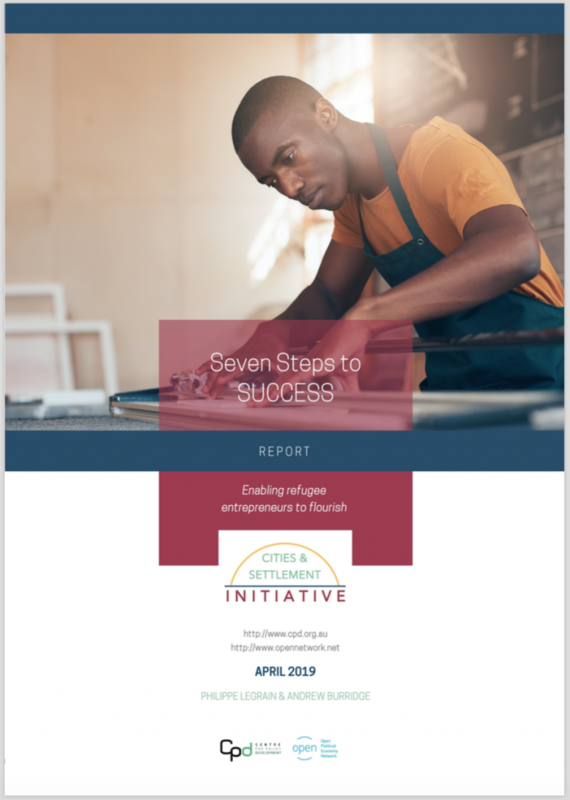 For schools to be effective in promoting cohesion through shared experience, understanding and opportunity, the networks they support and cultivate must reach across social and racial divides. In this way, schools mitigate social and cultural dynamics that might otherwise create and reinforce structural difference and discrimination between groups and individuals. The evidence presented in this discussion paper suggests that the capacity of our school system to act as catalyst for inclusion, equity and opportunity for Indigenous students is weakening. Rather than being places which bring people and communities together, evidence suggests that schools are yet another place where children grow further apart. In addition to the negative impacts on individual achievement and opportunity, the increasing separation of Indigenous students from other Australian school students has broader societal implications. 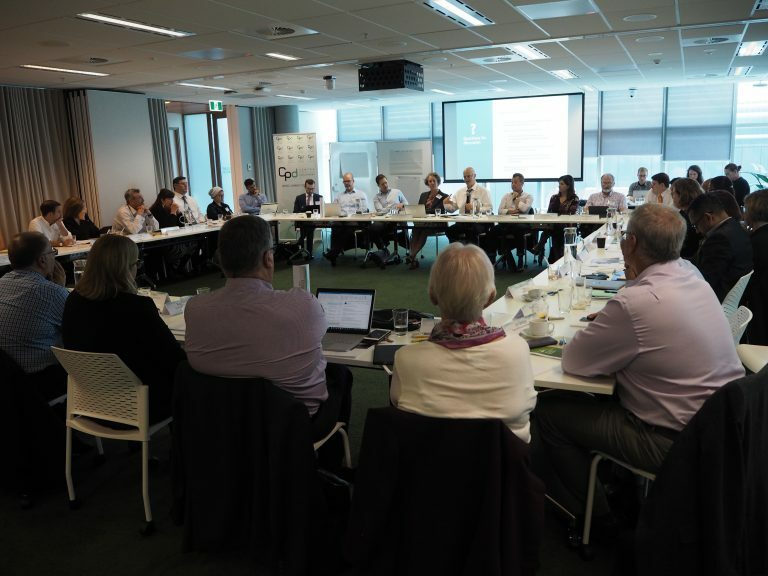 The paper does not offer specific policy prescriptions but aims to provide a conceptual first step and pointers for future policy action that might address what is a significant and concerning challenge to an equitable and inclusive Australia. 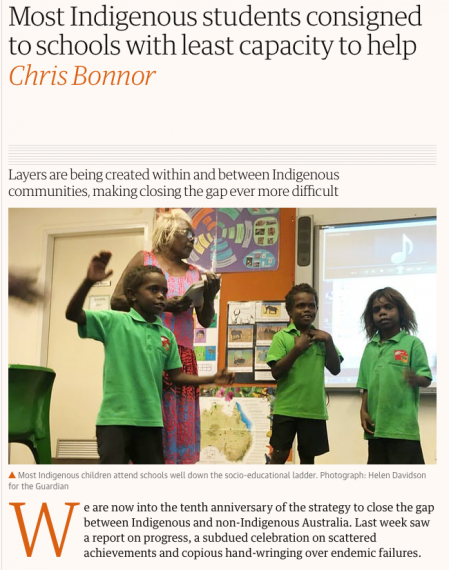 Progress made on Indigenous retention rates masks growing racial divide at schools, The Guardian, Michael McGowan. Most Indigenous students consigned to schools with least capacity to help, The Guardian, Chris Bonnor. Chris Bonnor and Bernie Shepherd published a piece on their latest findings in The Guardian.